The Las Vegas Strip in Clark County, Nevada USA is famous for its hotels and casinos, many of which have amazing architecture and lights. But there’s more to Vegas than the Strip. Normal people live normal lives in the rest of the town. They go to work or school and rarely go to the touristy area. We recently visited two cousins who live in Las Vegas proper, where they both work as lawyers. It was great to catch up and to cross the nearby Grand Canyon off our bucket list. We splurged and went by helicopter and it was indeed an amazing experience. Tom and Bob both live in houses located in the grounds of the Las Vegas Country Club and we stayed with Bob. Invited to the Club house for lunch on the day we arrived, I chose this delicious, healthy salad which was so good I decided to try and replicate it on my return. Make mayonnaise then make the three different salads by mixing all ingredients together. Use enough mayonnaise to bind the ingredients together. Refrigerate till serving time. Split pita breads in half horizontally, brush with olive oil and sprinkle with some finely grated Parmesan. Cut into long pointy pieces then bake at 180°C for 10-15 mins or until crisp and golden. Cool. Wash and trim asparagus and cook in boiling salted water for about 4 mins. Drain and cool. All of this can be done ahead. To serve, arrange salad leaves on four serving dishes – rectangular ones look good. Then place three tomato slices on each plate. Find a small rounded bowl, ramekin or measuring cup which holds about half a cup. The diameter needs to be about the size of the tomato slices. Spray with oil, fill with about a quarter of the mixture and pack down well. Tip out onto a tomato slice. Rinse, dry and re-oil then repeat with the other salads, so each serving has a mound of each. If preferred just dollop it on with a tablespoon. Garnish plates with asparagus, hard boiled egg slices, a shake of paprika and a couple of pita toasts. This easy recipe is perfect for a mid-week family dinner. Trim chicken and cut into 2-3cm chunks. In a large deep frying pan heat oil and cook the onions and garlic over medium heat, stirring often, until soft but not brown. Add the ginger and spices and cook for another 1-2 minutes, stirring. Add chutney, dried apricots, sweet potato, chicken stock and tinned tomatoes. Cover, lower the heat and simmer, stirring often for 20-30 minutes or until chicken is tender. Sprinkle with coriander and serve with couscous. My mother could make a chicken last three days, even though there were five of us in the family. Roast on Sunday, curried or cold on Monday and soup on Tuesday. Nothing was wasted and the idea wasn’t to fill up on chicken, but on the accompaniments. There were always lots of roast vegetables with the Sunday roast, rice with the curry and herb dumplings and vegetables in the soup. Fortunately those days of austerity are gone. I’m always looking for new ways to roast a whole chicken and this recipe, where you immerse it in brine overnight, caught my eye. It really does make a difference, resulting in very crispy skin and succulent meat. Serve it with roast potatoes and a green vegetable or salad. The sauce is delicious served with pretty much anything. Yes I know there’s only one lemon in the photo, but we were at the farm (45 minutes from the nearest shop) and I only had two and used one in the sauce! Place chicken on a chopping board, breast side down. Using poultry shears cut along one side of the backbone, then along the other side, remove and discard or keep for making stock. Turn chicken over and press hard on the breast bone to flatten it out. Place all ingredients for brine in a large saucepan and bring to the boil. Cool then place chicken in the brine and refrigerate overnight, covered. Next day remove chicken from brine, pat dry with paper towels, then leave in the fridge on a plate, uncovered, for at least an hour and up to several hours, so the skin dries out. Discard the brine. For the Herb sauce, place herbs and spinach leaves in a bowl and cover with boiling water. Drain, rinse under a cold tap, then squeeze out all the water, put into food processor with remaining ingredients and whiz till you have a thick green sauce. Brush chicken and lemon halves all over with oil then place in a roasting pan and roast in a hot oven at 200°C or on a barbecue for about an hour, or until chicken is browned and crispy. Turn chicken and lemon halves over about halfway through cooking time. 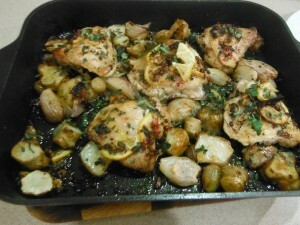 When chicken is ready carve and arrange on serving platter with the lemon halves and some fresh herbs. 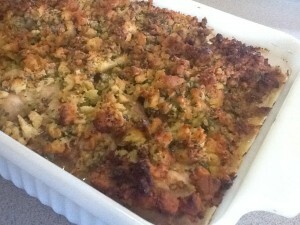 My friend Franca raved about this Chicken and Leek Gratin by Annabel Langbein so I couldn’t wait to try it. It lived up to its reputation and got a big tick firstly because it’s delicious and secondly because it’s quick to make. Wash, trim and chop the leeks, using all the white and a bit of the green part . Heat butter in a medium frying pan and cook leeks for 5-10 mins or until softened. Add the cream and season to taste. Spread leeks over the base of a buttered ovenproof lasagne-type dish. For the chicken layer, if liked cut each chicken piece in two then mix with remaining ingredients and arrange over the leeks. For the crust, make the crumbs first in a food process then add the remaining ingredients and pulse a few times to chop and combine, but don’t over-do it. Spread over the chicken. Recipe can be made ahead to this stage and kept in the fridge for up to 24 hours, covered or out of the fridge for an hour or two. Allow to come to room temperature. Cook in a preheated oven at 180°C for 50-60 minutes or until nicely browned and chicken is tender when pierced with a skewer. 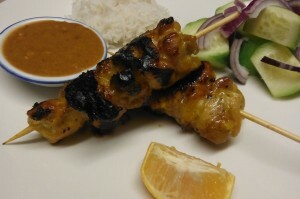 Everyone loves chicken satay and this recipe can be made in no time with ingredients you probably have in the pantry. It’s easy to halve for two or three people. The first time I made this the washer upper complained that the frying pan was very difficult to clean, because of the honey. A week or so later I was chatting to a friend about the virtues of using non-stick baking paper to line an oven tray when you’re baking salmon or chicken, so there’s nothing to wash up. My friend said this trick also works when you’re cooking something in a frying pan. So I tried it and it works. Just cut a circle of non-stick baking paper to fit the base of the pan and cook the satays on top. It doesn’t affect how they brown and the pan is so much easier to clean. No complaints from the washer upper this time. Cut chicken thigh into cubes. Mix marinade ingredients and add chicken. Leave to marinate for at least half an hour. Meanwhile, soak 16-20 short wooden bamboo skewers in warm water. Thread chicken cubes onto skewers. Heat a large non-stick frying pan or griddle pan and cook satays for a minute or two on all four sides, until cooked through and browned. Meanwhile mix all ingredients for sauce. Serve satays with the sauce, steamed rice, sliced onion, cucumber and lemon wedges. 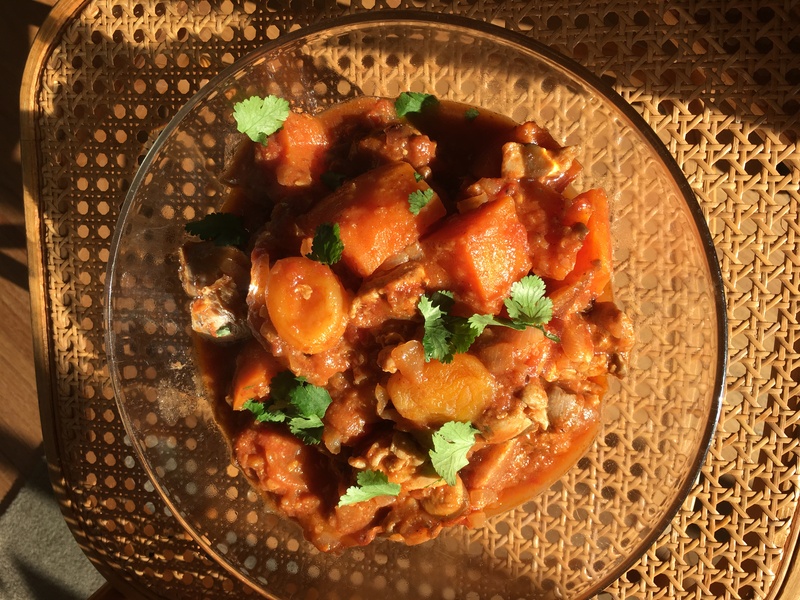 I found a recipe online for a really easy chicken recipe made in a slow cooker. Basically you cut up some boned and skinned chicken thighs, put them in the slow cooker with a few other ingredients, cover and cook on high for five hours. And that’s it. So following this basic idea I developed three variations. Perfect for busy people – this one’s for you Fiona. Place chicken and chosen sauce ingredients in slow cooker, stir. Cover and cook on High for about five hours, stirring once or twice during cooking time. Check seasoning. 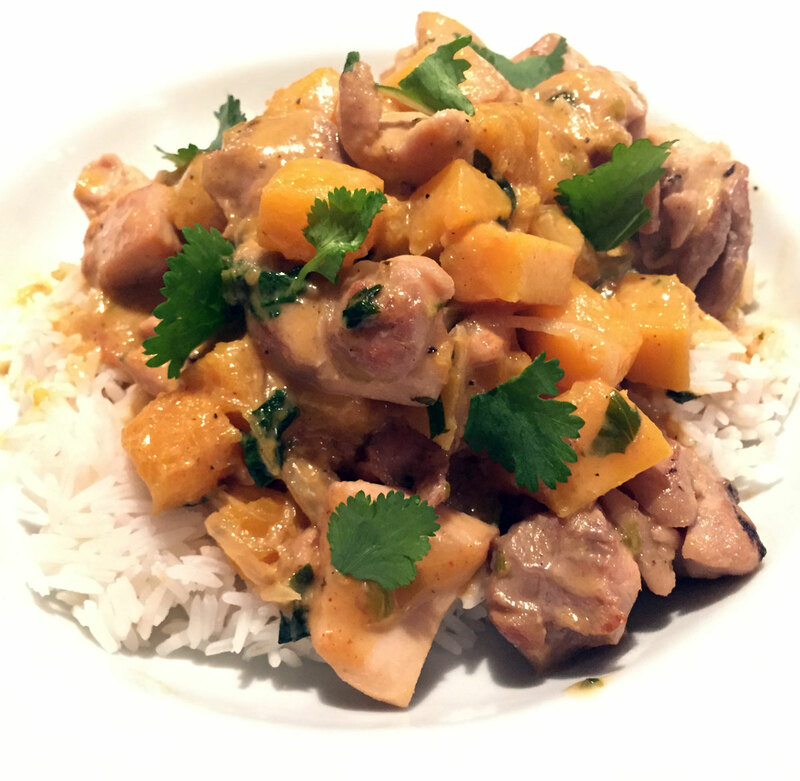 Serve with steamed rice or tacos or wraps. The Jerusalem artichokes from our veggie garden are ready to use, so I went through some cookbooks looking for new ways to use them. This easy and delicious recipe comes from Jerusalem by one of my favourite chefs, Yotam Ottolenghi and his partner Sami Tamimi. I’ve made a few slight adjustments. The original recipe uses fresh tarragon which I didn’t have, so I used marjoram which grows profusely in our garden and doesn’t get hit so early by the frost. It worked well. If you don’t have any saffron add a couple of teaspoons of turmeric. Ottolenghi says to peel the artichokes but it’s such a fiddly job we just scrub them and trim off any black bits. If you don’t have Jerusalem artichokes substitute parsnips, pumpkin, sweet potatoes or ordinary potatoes. Scrub and trim the artichokes, then cut into even chunks about 2cm thick. Place in a saucepan and cover with water. Bring to the boil and simmer for 10 mins, drain. Place all ingredients in a large mixing bowl and mix well with hands. Cover and leave to marinate for 1-2 hours or overnight. Preheat oven to 220°C. Tip chicken and marinade into a rectangular roasting tin (mine is non-stick) and spread out evenly. Cover with foil and roast for half an hour. Remove foil, baste chicken with the juices, then roast for a further 15 mins or until cooked and nicely browned. Serve garnished with some extra chopped fresh herbs and a squeeze of lemon juice. Note: pink peppercorns are not really peppercorns at all (look them up on Google if you’re interested). You can buy them in specialty shops such as The Essential Ingredient. They go well with smoked salmon, Gravlax, chicken and fish dishes. This recipe is adapted from one by Israeli-born Yotam Ottolenghi. He uses turkey mince. 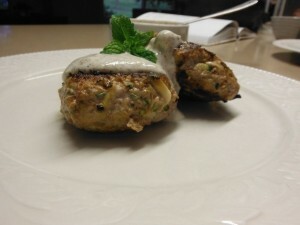 I used chicken mince, but you could also use pork or pork and veal mince. He pan fries them, then finishes them off in the oven. I just pan fried them. I also increased the cumin and added the pine nuts for a bit of crunch. This is a good way to get reluctant kids to eat some green vegetables. Any leftover burgers are delicious cold for lunch. Mix all ingredients for sauce in a small bowl and refrigerate until serving time. Mix all ingredients for burgers (not the oil) in a large bowl. Form into about 8 burgers or 16-18 large meatballs. Heat some vegetable oil in a large frying pan and cook the burgers in two batches for 5-6 minutes each side, or until nicely browned and cooked through. Serve burgers hot or cold with the sauce. Note: Sumac is a Middle Eastern spice mix. If you don’t have any use 2 tsp dried cumin and 2 tsp dried coriander instead. If preferred use 1 cup yoghurt for the sauce and leave out the sour cream. 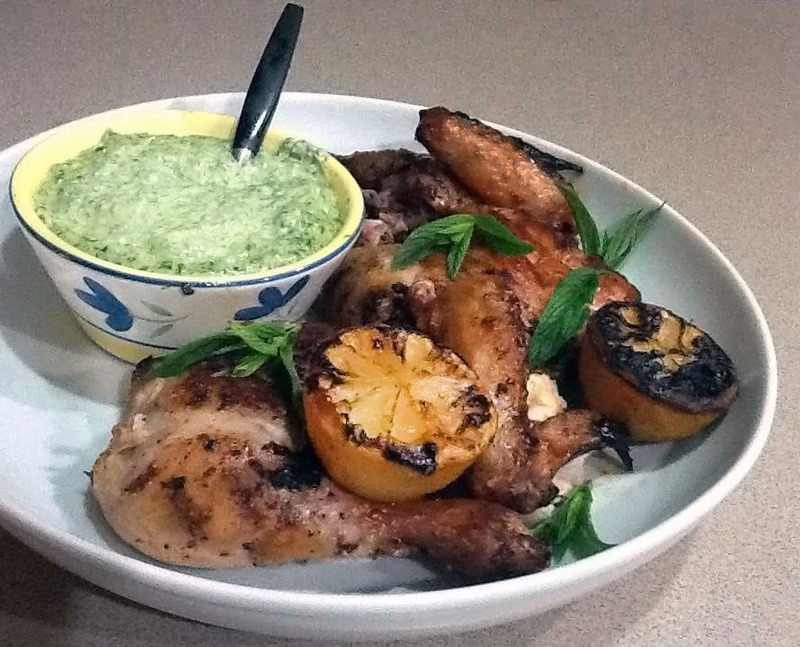 This delicious chicken recipe is one I’ve had for decades. It comes from a time when nobody worried about cream and butter. If you want to cut down on the cholesterol and calories just leave out the sauce. Having said that, what’s half a cup of cream between four people? 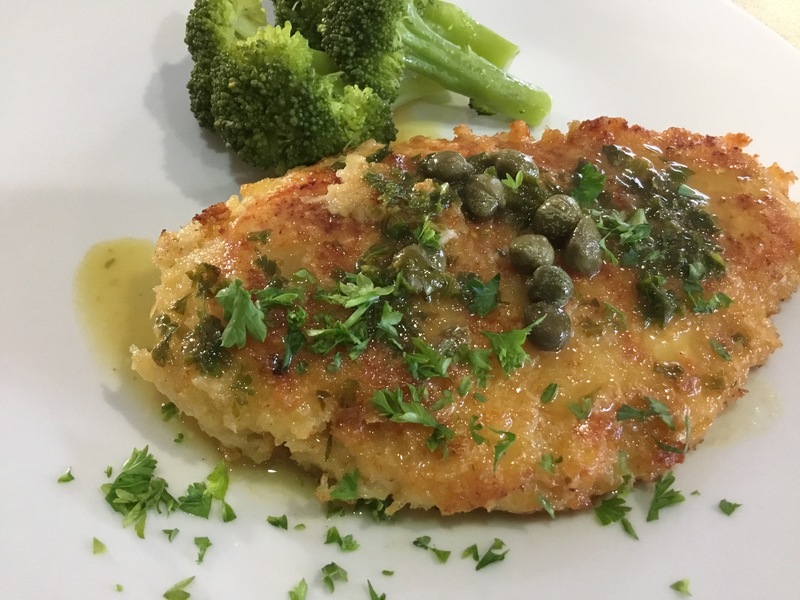 The recipe is easy to halve for two people and makes a perfect mid-week dinner served with a salad. Kids will probably like it without the sauce and in fact chicken breasts are so big these days you might find once you’ve sliced them here’s enough for more than four servings, especially a couple of small kids. Hammer out the thicker part of the chicken with a meat mallet so breasts have an even thickness, then marinate in lemon juice, wine, oil, S and P for 2 hours. Make the ground nuts by whizzing them in a food processor. 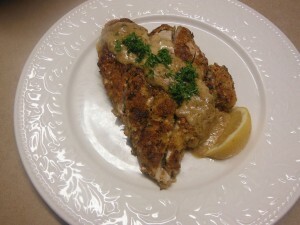 Mix breadcrumbs with ground nuts, oregano, parsley, lemon rind and Parmesan. Drain chicken, keeping marinade. Coat in the lightly seasoned flour, then the beaten egg and lastly the breadcrumb mixture . Press on well and if there’s time refrigerate until ready to cook. Heat butter and extra oil in a non-stick frying pan over moderate heat and cook chicken on both sides until golden brown and cooked through. This will take about 7-8 minutes each side. Remove from pan and keep warm. Add extra flour to the pan and stir to cook. Add marinade and simmer for 1 minute, then cream and heat but don’t boil. Slice each chicken breast into 5-6 slices and arrange on serving plates. Spoon sauce over chicken and garnish with extra parsley and lemon wedges.